If you had already been to Vietnam many times or this is your first time to travel to this wonderland, make sure you visit Phan Rang. Unlike many other tourist destinations across Vietnam, Phan Rang is more deserted, less affected by tourists. If you’re a person who loves nature and delicious food, visit Phan Rang. At dusk, fishermen have prepared and sail out to the East Sea, not further than 5 miles off shore to harvest the crops of the ocean. The boats are peculiar. They are round, oversized wicker baskets, which they propel and steer with one ore, and they release the nets from them. From ship to shore, from shore to the busy marketplace, Phan Rang will amaze you with its diverse culinary culture: from sea to mountains, from ancient to modern world. One of the most common courses in Phan Rang, which you can find almost anywhere in the city. The ingredients for a perfect bowl of soup cake are the soup cake fibers, fish rolls, minced fish, coriander, green onion, with on top is some black pepper. If you are the one who loves strong flavors and spicy, don’t hesitate to add some fish sauce with some slices of chilies and a slice of lemon. The soup cake is not too big but thin with smooth texture that can be detected when you taste. The key flavors of the soup cake bowl come from the fish rolls. They are made from the nearby sea fish like barracuda, feather back … These fishes are bought in the early morning from the harbor fish marketplace. The chef will use only the fillet to make the rolls while the bone will be used to sweeten the soup. 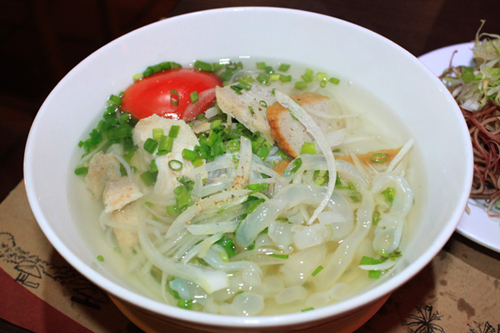 The one thing you should not miss when you visit Phan Rang or any place in Vietnam is the Bánh xèo. 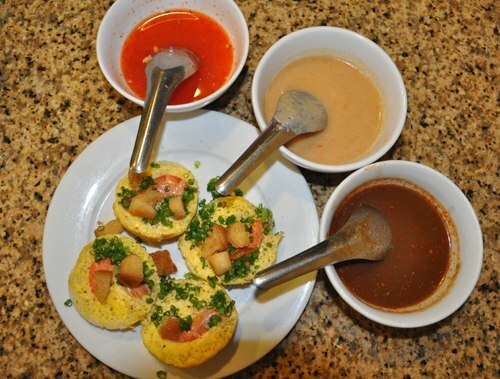 The flavor of the Phan Rang pancakes is slightly different from the Southern Vietnam pancakes. The cakes are made from the homemade rice flour, and cooked in the Chăm Bàu Trúc (Cham Bau Truc) ceramic mold of the Chăm (Cham) people. In the middle are fried pork, eggs, and other sea food like shrimps or squid… The thin crust outside, cooked until it turns yellow accompany with undeniable smell, cover the inside rich and appealing flavors of the mountains and the sea. The dish is best served on a windy day when the breeze from the sea swallows the coastal city. 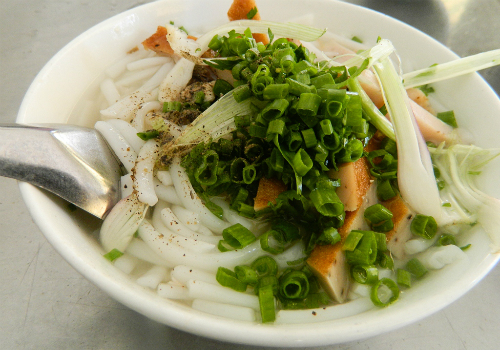 A taste of Phan Rang’s notorious bánh xèo will may help you partially understand the subtle of this land culinary culture. For each part of Vietnam, there is a different type of cake. 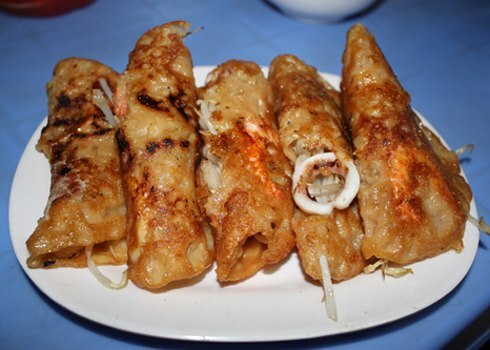 For the Central Vietnam, that is bánh bột lọc, for the southern provinces, it is bánh khọt. For Phan Rang, the capital of Ninh Thuan Province, it is Bánh căn (Can Cake) that attracted and mesmerized the minds of people who have set foot to this land. The stuffing consist many different ingredients such as squid, eggs, pork, shrimps depends on the choices of the customers. In order to make the, rice flour is essential. However, the process to make the flour into the cake is a traditional secret which has been passed generations to generations. It requires carefulness and exact timing in order not to overcook or undercook the cake. From early in the morning, the cake maker must prepare the oven so it can reach the cooking temperature on time. When the oven reached the cooking temperature, the rice flour secret mixed will be poured into the oven along with the stuffing based on the customers’ choices. When ready, the cake will be served with minced green onions, fish sauce with mango or peanuts, meatballs, vinegar, and hard-boiled egg. Jellies appear in the winter and increase their number in the spring, but they become rare in the rest of the year. So if you want to tryout this peculiar but exciting course, visit Phan Rang by that time. The list includes noodles, fresh jelly brought from the sea, quail eggs, tofu, green coriander, and some crushed peanuts on top. Accompany with the noodles are sliced banana flower, sliced spinach, sprout and most importantly, shrimp sauce. This is the flavor that balances the bowl of jelly noodles. Slowly enjoy each chopstick and you can taste the crunchy jelly, the fatness of peanut, tofu or the salty taste of the shrimp sauce. All of those delicious flavors will make you remember forever.